This chapter demonstrates about the SVG Filling Patterns which are used to fill a shape in a given image pattern, following are the concepts covered in this chapter. 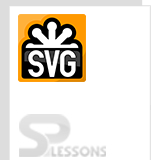 SVG Fill patterns are used to fill the images in a given pattern which can be made with the sbg images or bit map images. Fill patterns are similar to the what ever the pattern used in the photo shop so which are called as a tiles, the code below demonstrates the filling a pattern. <rect x="10" y="10" width="100" height="100"
User can give the own pattern to fill the shapes and which have the several types of examples some times are shown below. X,y attributes defines how far into the shape in the pattern element the patterns starts. Width and Height attributes defines height and width of the pattern the code as shown below. The code below demonstrates the fill patterns in a rectangle by adjusting the height and width of the rectangle as shown. Height and width attributes sets the height and width of the pattern. Fill patterns are similar to the Tiles. Fill attribute is the CSS property.